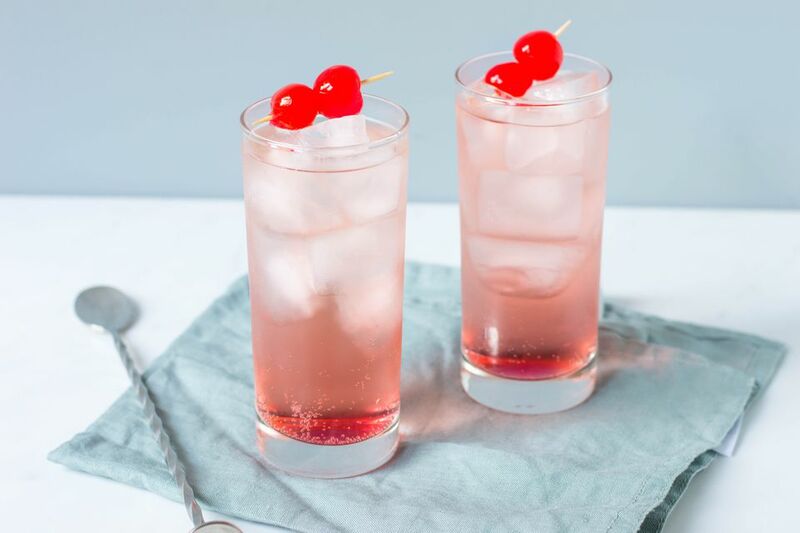 The Shirley Temple is one of the best non-alcoholic mixed drinks. It's so popular that you can order it for yourself or the kids at almost any restaurant. But there's no reason to wait for a dinner out, because it's incredibly easy to make at home. This homemade soda recipe was one of the original "mocktails" and it was named after the famous child star. Shirley Temple left a legacy beyond the movies and this fantastic mixed drink is just one of them. The drink is a nice way to dress up your average soda. It adds a little fruity sweetness via grenadine to two lightly flavored sodas. The result is a delicious drink that is great for dinner, as a refreshing afternoon drink for the family, or anytime you simply want a quick taste of an old-fashioned soda fountain. Pour grenadine into a collins glass with ice cubes. Why are there two sodas in the Shirley Temple recipe? It's a good question and a common one. While it is unusual, it is not unheard of in the world of drinks. For instance, the Presbyterian is a retro whiskey highball that combines club soda and ginger ale. The reason is that each soda brings its own flavor to these drinks and by splitting the two you get a pleasant balance with neither dominating. In the case of the Shirley Temple, the lemon-lime soda (7-Up, Sprite, or a similar brand) adds a refreshing citrus flavor. The ginger ale brings in a sweetened spice. Some people have taken to mixing only one of the sodas into a Shirley Temple. Quite often, they choose the ginger ale, though some prefer the lemon-lime soda alone. While either is nice when sweetened with grenadine, the combination of the two does make a difference in the finished drink. Give it a try for yourself. Mix grenadine with both sodas separately and compare those drinks with the Shirley Temple. You might be amazed at the results. No matter if you choose two sodas or prefer one over the other, keep in mind that a true Shirley Temple uses both. The myth may also be due, in part, to the fact that many of the grenadine syrups you can buy are artificially flavored. They can be made with a great variety of mysterious ingredients and you will find a few that do actually use cherry flavorings. The good news is that more quality grenadines are being produced as people realize that a drink mixer as valuable as this really should not be discounted as a novelty. If you are up for making your own grenadine, it is a fun family kitchen project and you'll find that it can save you money while improving your drinks. You can also use it for the occasional cocktail like the tempting tequila sunrise. If your family loves Shirley Temples, consider making your own grenadine. It's incredibly easy, requires just a few ingredients, and can be stored in the refrigerator for a week at a time. You can choose a recipe that uses pomegranate juice or, during pomegranate season, opt for a grenadine recipe that uses the fresh fruit. How Do You Make a Virgin Tequila Sunrise?